Now in it's 10th year, the West Midlands Vegan Festival is the longest running grassroots vegan festival in the UK! The huge 2 day event will offer all you need for compassionate, healthy, eco-friendly living. You don't have to be veggie or vegan to attend, everyone is welcome! Come and see why people are increasingly adopting a vegan lifestyle. The 2016 festival was our best ever, with over 150 fantastic stalls, 40 inspiring talks and 6,000 visitors over the weekend, half of them non-vegans! With many exciting new vegan companies launching all the time, our 2017 festival will include more mouth-watering food & ethical products than ever before! The festival is being held at 2 venues - Wolverhampton Civic Hall in the city centre, 10 minutes walk from the train/bus stations and also the Art Gallery, 3 mins walk from the Civic. Click here for a map, directions, car parks etc. The festival will be open from 10am - 6pm both days. Admission is just £1 (under 16's free), payable at the door. Would your company/organisation like to sponsor the festival? Would you be interested in donating items for our goodie bags, raffle prizes, food samples etc? You could help to ensure the event is a massive success and in return, we will promote you on this website, leaflets, posters and in the event programme to be handed out on the day. If you can help, please contact us. 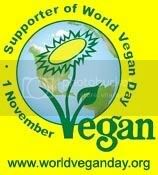 Our first festival was staged on Sat 1st November 2008 (World Vegan Day) in the Wulfrun Hall. 1,200 people flocked to the event throughout the day. Click here to read more about the festival and see lots of photos. Our second festival took place on Sat 24th October 2009, again in the Wulfrun Hall. People queued to get in long before the doors opened. The festival was bigger than the year before, with more talks and cookery demos and a dedicated entertainment room! Click here to see our gallery of photos. Our third festival on Saturday 30th October 2010 was 50% bigger than the previous year, with 90 stalls & over 20 talks! Moving into the much larger Civic Hall paid off as we attracted a total of 1,500 visitors. Star of TV's Emmerdale, Roxanne Ghawam-Shahidi, opened the festival as an estimated 300 people queued to get in!! Our fourth festival took place on Sat 29th October 2011. The event attracted a record 1,700 visitors and was bursting at the seams throughout the day!! Our fifth festival, on Sat 27th October 2012, was bigger and busier than ever before, with over 100 stalls and 2,000 visitors! Both the Civic and Wulfrun Halls were used for the first time, allowing visitors more room to spread out, but the venue was still packed out from start to finish!! Our sixth festival, on Sat 26th October 2013, made better use of some areas of the venue and even spread outside, allowing visitors more space to enjoy the event! Our seventh festival, on Sat 25th October 2014, was our best ever, with over 100 fantastic stalls and 3,000 visitors, half of them non-vegans! Our eighth festival in 2015 was the first grassroots vegan fest in the UK to become a 2 day event, on Sat 24th and Sun 25th October!! Our ninth festival in 2016 featured over 150 stalls & there were 6,000 visitors over the weekend, half of them non-vegans!